Vella Gulf (156.86E 7.92S) is located between Kolombangara and Vella Lavella. Battle of Vella Gulf. On 5 August 1943 Allied intelligence reported preparations for a "Tokyo Express" run to Kolombangara. Admiral Wilkinson ordered the commander of Destroyer Division 12, Commander Frederick Moosbrugger, to take his division plus elements of Destroyer Division 15 to intercept on the night of 6 August. The decision to send destroyers alone was prompted by the fact that Merrill's cruiser force was too far away to intercept in time. The destroyermen had been arguing that destroyers should be permitted an opportunity to operate on their own, and Wilkinson, an old destroyerman himself, may have been sympathetic to this view. Wilkinson still had no sure intelligence on the Long Lance, but he advised Moosbrugger that Japanese torpedoes were thought to be superior to American, while American gunnery was thought to be superior to Japanese. Moosbrugger was therefore advised to engage at long range, but he had been training his ships in radar-controlled torpedo attack for months, and Wilkinson gave him freedom of action once he was on station. Moosbrugger outlined his plans to the ship commanders at breakfast on 6 August 1943. He planned to organize his six ships into two parallel columns. He would personally command the column with heavier torpedo armament, while the other three destroyers, which had sacrificed some torpedo tubes for better antiaircraft armament, would form the second column. 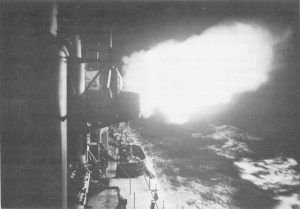 If a Japanese destroyer force was encountered, as Moosbrugger expected, he would attack with torpedoes from both quarters, then turn away to avoid any counterattack and open the range for a gun duel. By 1130 the force was underway. The Japanese force consisted of four destroyers carrying 900 reinforcements and 50 tons of supplies. The commander, Captain Sugiura Kaju, knew his group had been spotted by American search aircraft but pressed on, expecting to reach Vella Gulf around midnight. Moosbrugger was advised of the Japanese course and speed and entered Vella Gulf from the south at around 2228 in their two columns. Heading north along the Kolombangara coast, the Americans spotted the Japanese ships on radar at about 2233. Moosbrugger turned to a reciprocal course, and at 2341 ordered torpedoes launched. The setup was almost ideal and the Japanese had not yet spotted the Americans. By now the Americans had disconnected their balky magnetic detonators and had fitted their torpedo tubes with flash suppressors. On launching their torpedoes, Moosbrugger's three ships turned hard to starboard to avoid counterattack, as planned. The Japanese were not expecting any opposition larger than PT boats, which they did not fear. At 2324 a number of confused sightings were reported to Sugiara, but by the time the enemy had been identified as four destroyers turning hard to starboard, it was too late to evade. Hagikaze was hit in a fire room by one or two torpedoes and Arashi was hit in its fire rooms by two or three torpedoes. Kawakaze was hit in the forward magazine and exploded. Shigure evaded and returned fire with eight torpedoes, but Moosbrugger's high-speed turn successfully evaded the counterattack. Shigure then turned away and laid smoke. Simpson had impatiently turned hard to port to try to cross the T, which fortuitously took him out of the path of Shigure's torpedoes. The sounds of exploding torpedoes was the signal to open gunfire on the enemy. Kawakaze was quickly finished. Moosbrugger now turned south and opened fire at burning Japanese ships. Simpson turned east while maintaining fire, and Moosbrugger turned northwest to intercept any supporting units. Shigure had reloaded and was charging back in at 0010 when the explosion of Arashi's magazine convinced her commander that the Japanese ships were being bombed by PBY Catalina "Black Cats." He promptly withdrew. Lang found herself sailing through masses of Japanese survivors, who were chanting in unison to try to attract the attention of their own ships. Moosbrugger ordered her commander to attempt to pick up prisoners, but the Japanese survivors fell silent and swam away whenever they heard English spoken. By 0200 Lang gave up the rescue attempt. The battle was a decisive American victory. Three Japanese destroyers had been sunk in exchange for a single sailor crushing his hand while loading a gun. At least 1500 Japanese soldiers and sailors were killed, and of 300 who reached shore, many fell victim to disease or natives friendly to the Allies, and few ever returned to Japan.